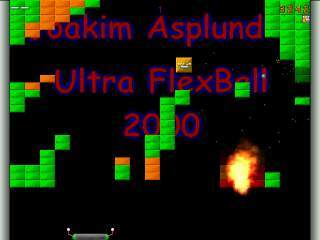 Caiman free games: Ultra FlexBall 2000 by Joakim Asplund. I have written a computer game called Ultra FlexBall 2000. It is a Breakout-style game (like Arkanoid and DX-Ball). I have drawn most graphics myself and the levels are made by my friends Peter Selberg, Joel Eriksson, Jonas Ask and some by me. Joel's levels are still missing, but now Jonas's levels are included and the level editor so you can make your own! Downloadpage at the creators site .